This year has seen a continued exploration of Scotland's vast bouldering potential, with many new venues and ascents from a growing critical mass of boulderers. The sheer remoteness of some venues has meant repeats will be slow in coming, but these are some of the most impressive confirmed bouldering ascents of the year. March 2005, Dumbarton. 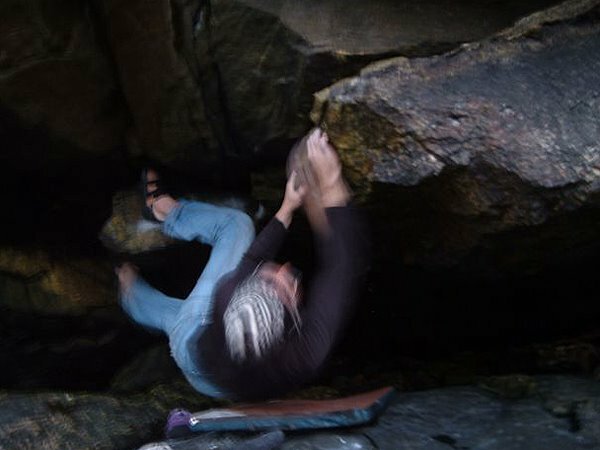 An invigorated Dave Macleod climbs the link-up into his previous year's highlight of 'Sabotage' to give 'The Perfect Crime' - a tortuous adventure out of the depths of the BNI cave onto the lip of the BNI slab. 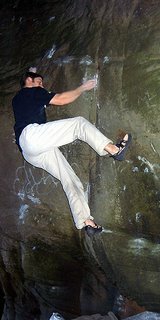 Dumby's first V13, but not his last this year! 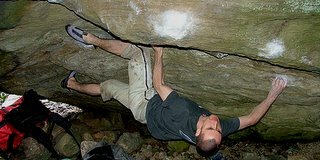 Not a traditional month for bouldering, June in Scotland can be cool and perfect for hanging slopers when other areas in the UK are too soapy. 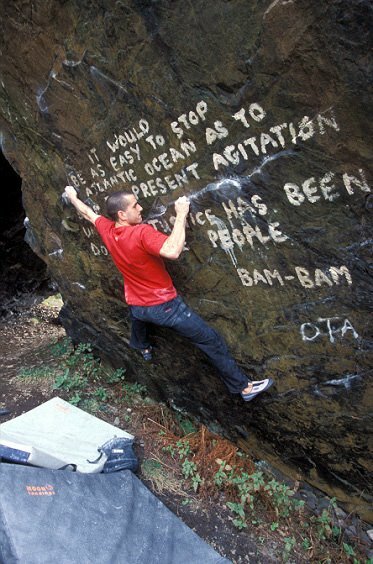 At Dumbarton, Malcolm Smith took advantage of his strength and reasonable conditions to link up the two lines of 'Pongo Sit-start' and the reverse of 'In Bloom' to give the bicep-mashing combination that is 'Supersize Me' V13, laying down the guantlet to MacLeod once more! Again in June, on the east shores of Loch Lomond, Chris Graham revisited the Spinach boulder and climbed its impressive roof to give 'Out of the Blue' at a grade of V9. 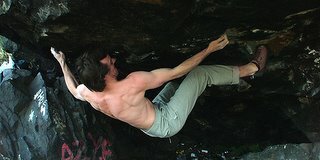 Sweet Cheeks 7c Climb the impressive overhanging arete on the landward side of the biggest boulder from a sitting start off the obvious break. Excellent moves slapping up Sweet Cheeks! 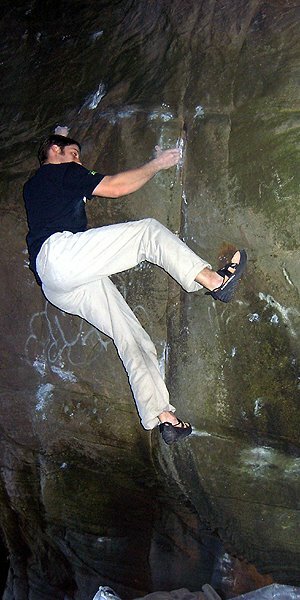 Central Belt Mafia 7c+/8a From the sitting start of Sweet Cheeks take the right side of the arete up to the hanging blind crack, slap up crimps and slopers either side of this to a hard rockover onto the slab (the problem Candy Man 7b) the scoop on the left is out. 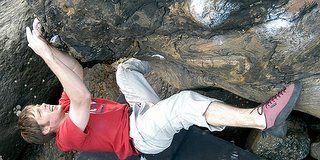 This time I found a bit more toe hook trickery that made the crux flow much better and immediately I started getting to the last couple of moves. I fell off 11 times from the last move then had 5 days off and did it first try December 12. I hit the jug but my feet came off (which normally means game over) but had a weird cut loose moment where time slows down and you cant tell if you've done it till the legs finally swing in again. A great way to end the year with possibly the most demanding of the V13's at Dumby! 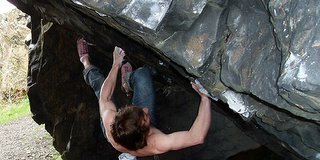 There were notable repeats: Tim Rankin climbed Craig's Wall and the sit start to Shrinking Violet at the Thirstane - confirming it to be hard and worth V11. Tim Rankin on Shrinking Violet V11, Thirlstane. Pic courtesy of Tim Rankin. 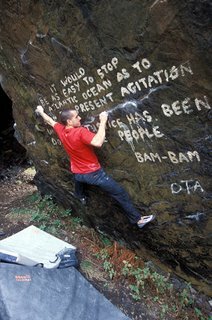 Gary Vincent mashed 'King Kong' in a fight and in December the route-maestro Alan Cassidy repeated the awesome 'Sabotage' (nice one Alan!)... 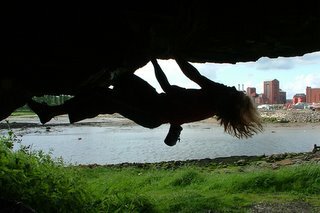 the list goes one, but lots of people made great progress this year and expanded the range of venues... I'll cover that in another post. 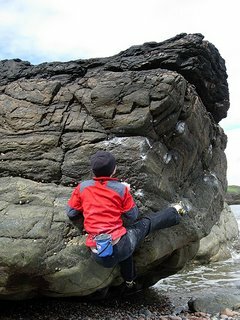 "Itâ€™s a few miles south of Portlethen â€“ a broad pebbly beach with assorted boulders, craglets and pinnacles that now offers nearly 100 problems, mostly very easy but with a few up to V5. 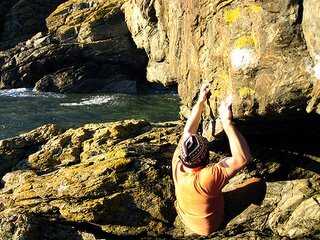 As such, it will hopefully attract those who find the Portlethen circuit a little too intense, and/or those new to bouldering. 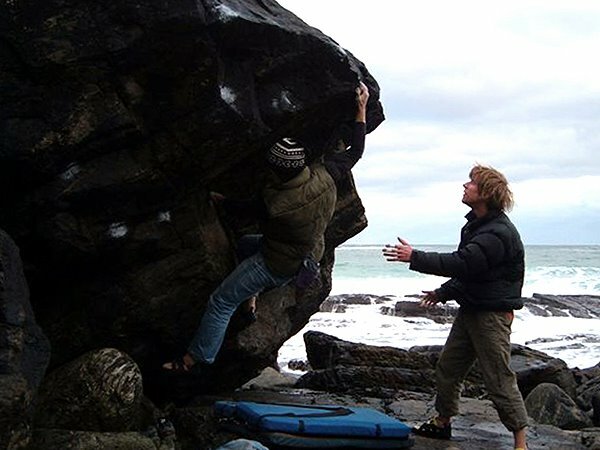 The mostly friendly landings also make a pleasant change from the boulders and rocks on other coastal spots. 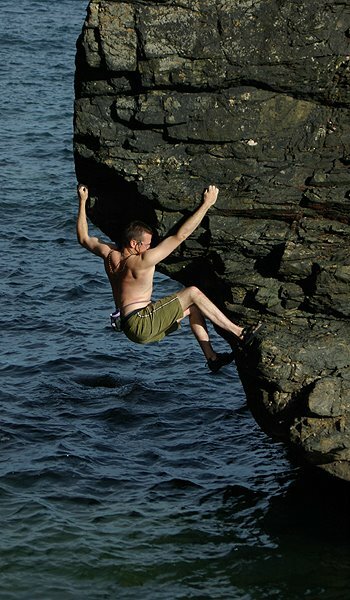 That said, there are a few problems which require a â€˜shallow water soloingâ€™ mentality, including Chris Fryerâ€™s Smile Around the Face. Downsides? 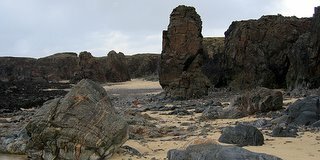 Well, itâ€™s more tidal than Portlethen, so barnacles can be a problem when the tide is out, and the problems are spread out over a larger area. Potential for more problems? The area immediately north of the current developments is a complex arrangement of through-caves and arches which provide some very steep rock. Some of it is crumbly, some of it is greasy, but there are areas which could yield some much harder problems than have currently been climbed. There is also potential for some sport routes to be done on the landward face of the massive stack/headland out to sea from the descent path. The main developers have been myself, Amanda Lyons, Chris Fryer and Rowie Beaton, with the odd contribution from Ben Tye, Andy Inglis, Matthew Bernstein and Dave Bruce. 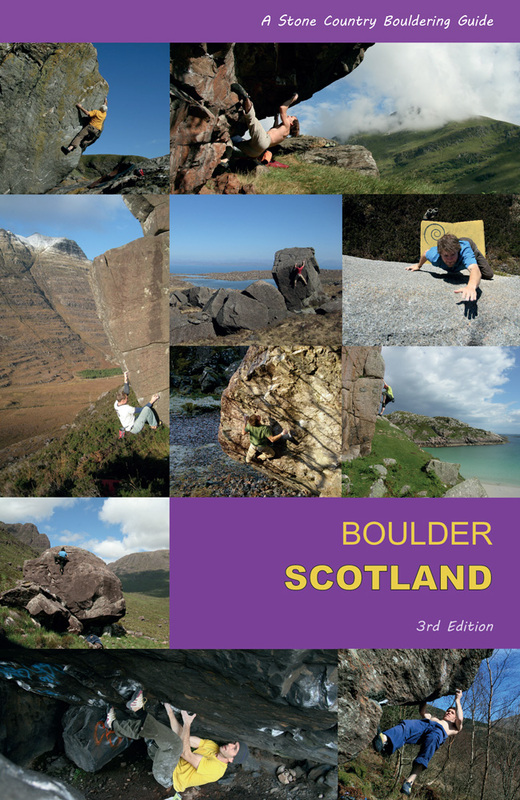 Iâ€™ve put together a wee guide to the areas which Tisos are selling for me â€“ full colour topos plus text descriptions of every problem plus photo illustrations throughout." The winter solstice, 6 hours of daylight, the sun skimming low over a watery horizon, driven by a Hebridean wind. The rain lashes the window like sand and the wind hokes in the chimneys looking for something lost... it was only to be expected on a winter bouldering trip to Lewis. The land here is romantically bleak and skirted with a coastal fringe of hardbitten gneiss: veins of ancient colour run through it and everything has shape in it, like frozen creatures in the midst of some weird metamorphosis. 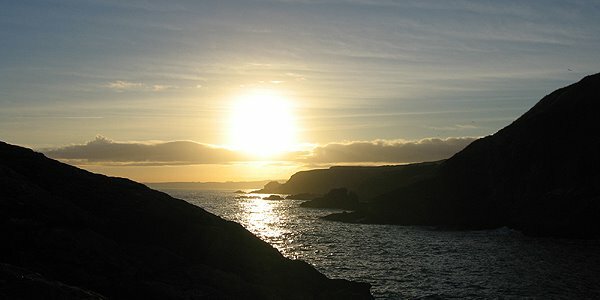 The old myths of being turned to stone if you look back are evident everywhere on this howling coastline. A museum of rock where the pinnacles, the waves of rock, the faces in stone, the tortured headlands, exhibit the faces of a previous life beyond all memory. 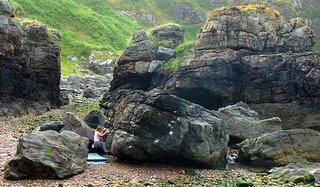 This is where the old Gaelic stories are born out of the exposed stones and given the cloth of meaning. Good people live here, with television and internet and wellies in the hall, but it is as if when we come here we all move like beings caught in the amber of ancient myth. 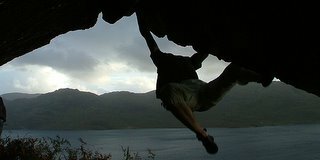 The climbing was disappointing, mainly due to the inclement seepage on the best lines, very frustrating for a short visit, but it's easier to be patient here in this old land and there are other things to be learnt from the rock and nature when you can't climb. I was shown around and explored some of the steeper lines, hoping they would be dry and maybe I'd get some stunning footage on film, but it was not to be. 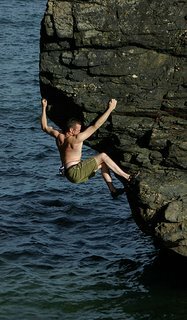 The only line we found climbable were the lines on the Sea Peanut at Port Nis and the nearby Atlantic Bridge cave, which John Watson despatched with more obvious holds for a less giddy proposal than the first ascensionist! John pronounced it a three-star classic, if only the nearby primeval power of wind and sea didn't make it all seem so embarrassing to proclaim such a thing! 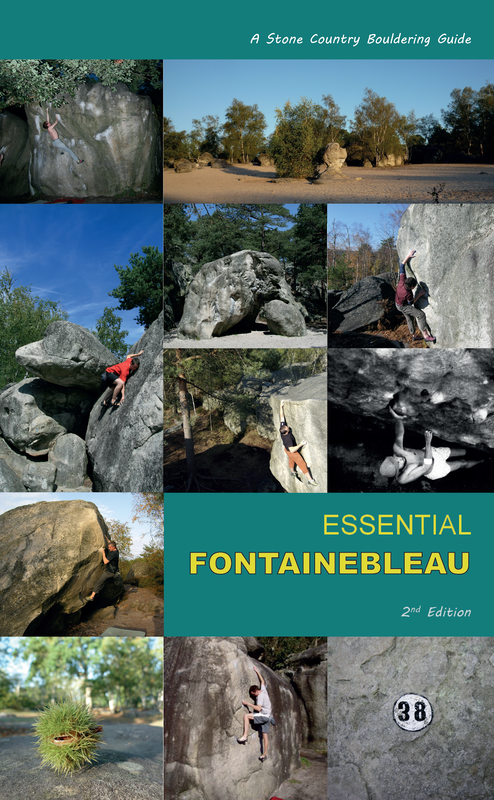 Certainly one to seek out if you're in the area. 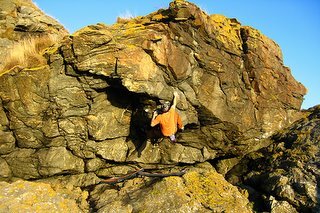 A flying visit to Clisham and Tarbert led to the discovery of some more fine rock and hopefully some forthcoming film on one of the finest pieces of rock in this corner of the world. 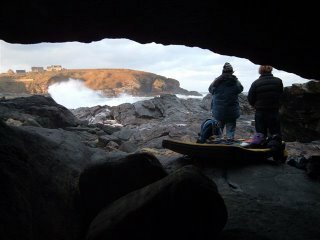 Superb hospitality awaits you here, and some excellent rock: take a pinch of salt, do not be terrified by the myths and leave your hubris behind - it's a land of generous movement and wild dreams. 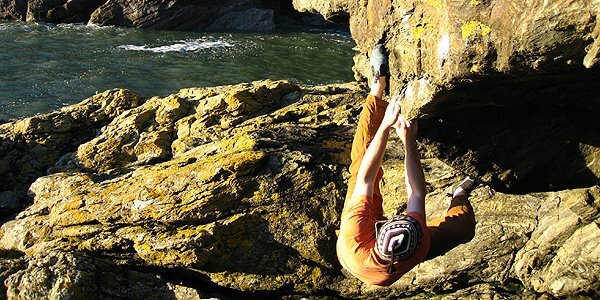 Tim Rankin has been extending the Aberdeen bouldering scene south along the sea cliffs of Portlethen, adding about 40 problems and his hardest to date at about V11. Unsure of the precise location, I kept bashing along the coves and platforms until it became obvious where the bouldering was to be had - sun-drenched walls of gold-quartzed schist, solitude and a breathing ocean. 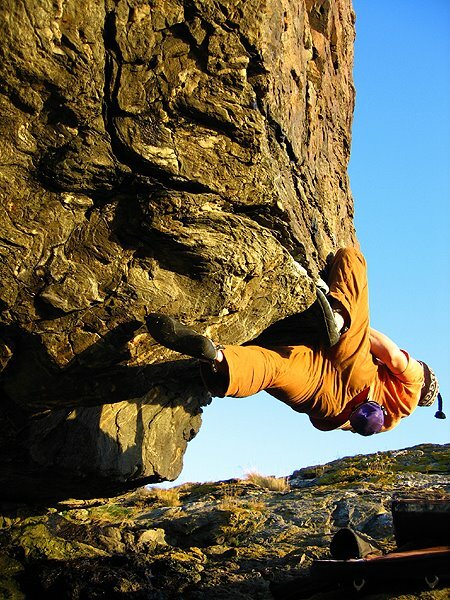 With the sun sinking like a slow flare, I pitched the mats and got cranking on a big boulder. The rest was a blur of movement and failure and occasionally success.